Freedom Friday – Throw off Those Clothes! My oldest daughter recently came home for a two week visit carrying 53 pounds of clothes in her suitcase. She is a little girl (at 36 years of age) so THAT my friends is a lot of clothes! You should’ve seen us lugging her gigantic suitcase up the front stairs. Pushing, pulling, falling, laughing. When we finally got the suitcase to her room I sat on the bed and watched as she hung one pretty thing after another in the guest room closet. It was so good to have her home. This got me to thinking about the spiritual clothes we wear. Especially me. Especially lately. Welcome to FREEDOM FRIDAY – A devotional, emotional, spiritual and sometimes hysterical series that I will be sharing on occasional Fridays, in addition to my regular Old Things New posts. Why? Because though once bound in chains Christ has set me free – FREE to live, to love, to dance, to sing, to be who God created me to be! Much has been going on in our lives these past few months that I haven’t shared here in my hopefully upbeat blog space. A slew of medical tests for myself, heartbreak with family members, ageing in-laws across the country, and seeing my husband so ill that he was admitted to the hospital for 30 hours of testing symptoms that still haven’t fully resolved. Stress seems to be a constant lately. Trials or disappointments in life can cause us to put on cloaks that we as Christ followers have no business wearing. Robes of fear, insecurity, worry, inadequacy, angst. I don’t know about you but sometimes the cloak becomes so heavy on my shoulders that it distracts me from hearing God speak and prevents me from being able to find the words to cry out to Him when I most need to. This is where I found myself the other day when I picked up my Bible and my journal and cried out to God. His answer? “Embrace hardships,” or as the KJV version reads, “Consider it pure joy, . . . whenever you face trials . . .” Really? I knew this passage was speaking to me and to the discouragement, worry, and pure overwhelmedness (spell check tells me this is not a word but I like it) I was feeling. Right then and there I knew that I had to surrender, ask God to forgive me for picking up and putting on the dark cloak of worry and anxiousness that was weighing heavy upon my shoulders. I had to tell Him how sorry I was for not trusting Him when I know, that I know, that I KNOW He holds the future and He cares deeply about every detail of my life. I agreed to let go and trust Him with the thoughts and feelings that consumed me. He met me right where I was as the dark robe of the enemy fell away and His mantle of peace covered me. Click To Tweet I don’t have full joy in the trial yet but neither do I have the anxiety. Just for today I can say with confidence that I trust Him completely. No matter what is going on in and around me I know that He is doing a new thing and I’m excited to see what He has in store as I step forward with boldness onto the path He is clearing before me. Do you wear the weight of the world upon your shoulders? Are you trying to control circumstances to no avail? Do you feel depressed or anxious? If you have given your life over to Jesus He loves you and He will walk with you through the hardships, feeling every hurt right along with you. He will grant to you all that you need for the battle as He “gives lavishly” to those He calls His own. If you haven’t yet accepted Jesus as your Savior He is waiting to lift off those garments of insecurity, sadness, or fear of the future and clothe you in perfect peace. I am reading a book right now called Hope Prevails by Dr. Michelle Bengtson. She writes from a doctor’s personal perspective about depression. While this book is written for those who are depressed or have people they care about who are suffering depression it has also helped me to stave off the heaviness I feel as I face some of my fiercest spiritual battles in years. Dr. Michelle’s book releases on August 16th and I will be sharing a complete review with you soon. Right now though, you can pre-order the book and receive a free gift by going to Dr. Michelle’s website. You’re speaking to my heart today, friend. Taking off the dark cloak, and putting on his peace and righteousness. #HopePrevails! Oh, my dear and sweet friend! I had no idea you were struggling with so much lately. I am sorry to hear about Mr OTN. I pray he is better, and that you now have some answers. I’ve been so unbelievably busy and preoccupied with my own goings on that I have neglected you. I’m sorry. Ah Sharon, you are so dear. I haven’t really said much here on the blog but thought it was appropriate to share today. Maybe it is because I have gotten through the hardest emotions and also because I want to continue to be as authentic as I can about my perfectly imperfect life. Things aren’t resolved but God has calmed the storm inside me. Please don’t feel bad! I know we all have things we go through. You are awesome! If you’d like to do something you can pray for all of my family, hubby and kids. There is a great spiritual battle going on in our lives and I know that God will be victorious in His time! Your blog is so encouraging. I’m so thankful for knowing Jesus. He is my new hope every day. I’m trying to keep my eyes on him as I face family stresses. Thank you Shannon for the sweet comment. I am happy that you know Jesus and it is good to hear that you are keeping your HOPE in Him! God bless you as you face your family difficulties. He is sovereign and He cares so much about every little detail. Blessings to you dear one. First of all, I love your daughter’s suitcase! I want all of these hard things to be resolved for you but I also know that God Already Knows About This and is working on them. I love your pretty posts in your lovely home, but these posts are important too as they give us prayer purpose. 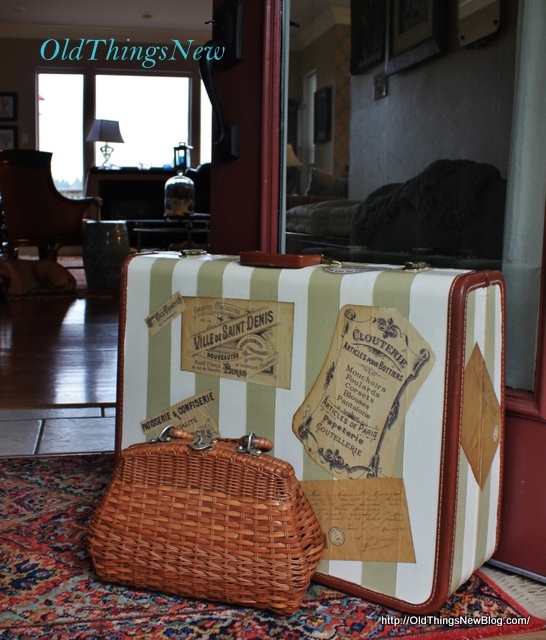 Well, this isn’t really her suitcase Susan but one I made for a French Flea Market a few years back. Hers was actually MUCH bigger! LOL! I have been studying Romans for the past several weeks in Sunday School and find that 5:1 and Chapter 8 speak very powerfully about these fears and issues you mention. In fact, the entire book tells me that as justified believers we are clothed with a glorious white robe of righteousness that keeps us safe in God’s love. However, I think we all have the human tendacy to hold on to the old fleshly worry cloak and try to don it from time to time. Positionally yes, we are clothed in glorious white robes! So sad that the old nature rears it’s ugly head in an attempt to defeat us, but hope prevails! What a welcome and timely message that was from your Scripture reading, Patti. And Dr. Michelle’s book sounds incredible too–giving you more of the same kind of encouragement during your time of crisis and trial. Thanks for letting the insights and encouragement you’re gleaning during this time of adversity be turned into encouragement for the rest of us! Praying for resolution and healing of your husband’s symptoms. 🙁 That’s tough when things go undiagnosed. But you’re wise to put on your garments of righteousness to ride it out. The Lord always gives victory. Amen to that Lisa! He is for us not against us. Thank you for your prayers. I get that same feeling of “throwing off those clothes” right after a refreshing rain shower or snow, dear friend! I can feel the refreshing Spirit of Christ rushing over me and cleansing me of all the “extra’s” I picked up along the way! Can you imagine how “refreshed” I felt this morning as we had a Summer shower just before Worship? I enter His courts with thanksgiving in my heart and my soul! Blessings upon you as you face situations ahead! In Sunday School Class this morning, we discussed the Scripture Matthew 5:25~34! Perfect timing! Matthew 5:25-34, The Cure for Anxiety, and a Scripture I’ve reminded myself of often over the years. I like that you equate a rain shower to a cleansing of the “extras” picked up along the way. A shower is indeed refreshing, especially after a long season of drought. Thank you Pat for the blessings. I know you can relate to trials yourself so blessings back at you too my friend. Thank you for being such a great friend. Love these words from Colossians 3 — Therefore, as God’s chosen people, holy and dearly loved, clothe yourselves with compassion, kindness, humility, gentleness, and patience. As I read Michelle B’s strong words about living life above the cloud of depression, I see her encouraging us to make this good choice to PUT ON the godliness the Spirit empowers — and to live in that truth. That is a perfect passage and I wish I had included it in my post Michele! Isn’t it fun being a part of reviewing Dr. B’s book? We have to do the work of throwing off the lies and putting on the truth but God brings the victory! Life can be stressful. I’m so sorry for all that you’re going through. I love the analogy with the suitcase and the heavy load we often try to carry on our own. I’m visiting from FaithandFriends today. Life can indeed be stressful Valerie but God is kind of drawn to the brokenhearted 😉 Thank you for your kind words. What an encouraging word, Patti! I found your post today on Moment of Hope. I’m sharing it on FB, Pinterest, and Twitter because I liked it so much! Awww…Melanie, you are the sweetest! Thank you so much for sharing around the web. I am so glad you linked up with Glimpses this week so I could come read this encouraging post. We have our share of hardships over the last several years, and I have been weighted down with cloaks of fear, doubt, anxiety and depression. Thank you for these words today. They really helped lift my spirit. Thank you Barbie. I know that your family has been going through a tremendously hard time, as has mine. We not only have God to take all our burdens, but we are better together sista’! Blessings to y’all this week. Oh yes … how easy it is to throw on those extra layers of unnecessary clothing! Thank you for the reminder and I’m throwing off every hindrance with you as we race to the finish line! Thank you so much for joining me at Moments of Hope! I appreciate you! Thank you Lori! I’m happy I found your Moments of Hope party and look forward to joining you weekly.